How Curing Methods Affect High-Strength Concrete | Giatec Scientific Inc.
ASTM C31 is the standard that defines two different concrete curing conditions, standard curing and field curing. It is the standard that dictates the procedures for making and curing test cylinders and can become a problem when an engineer or purchaser argues that field-cured test cylinders must be the basis of acceptance for a project. ASTM C31 section 10.1 defines standard curing as a condition that “involves subjecting the specimens to standard temperature and humidity conditions.” According to ASTM C511, these test specimens are generally stored in curing tanks or rooms at 23.0 ± 2°C and at a relative humidity (RH) greater than 95%. The results from standard-cured test cylinders are primarily used for quality control and concrete acceptance. ASTM C31 section 10.2 defines field curing as a condition that “involves subjecting the specimens to the temperature and humidity that the actual structure experiences.” These test specimens are stored alongside the structural element in question to ensure similar relative humidity and ambient temperatures. The strength results from field-cured test cylinders are predominantly used for determining whether a structure is ready for formwork removal and other critical construction operations such as opening roads to traffic. In many cases, engineers have encountered discrepancies between the two testing methods. 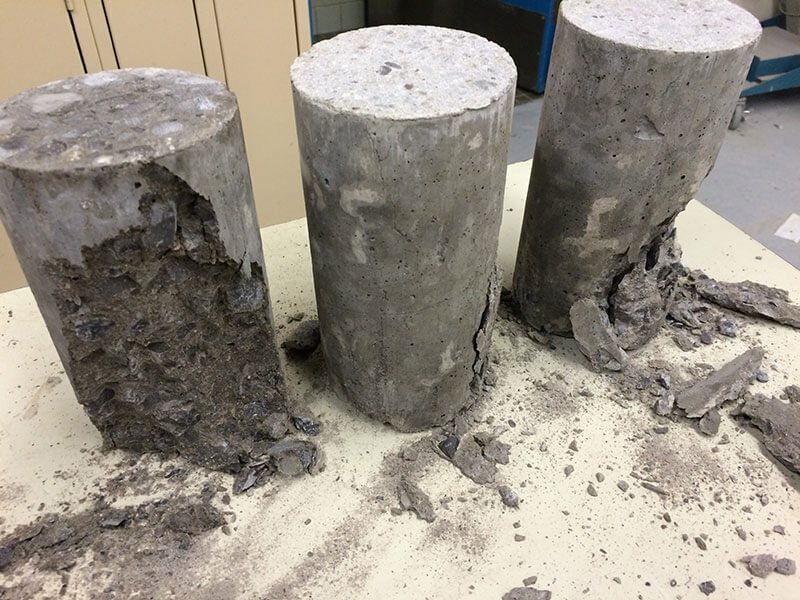 For example, one technician in a testing laboratory was testing high-strength field-cured and standard-cured specimens for quality assurance found that the field-cured specimens of high-strength concrete were consistently breaking at 25-35% lower strengths than the standard-cured cylinders. While it is assumed that the technician had been using testing procedures that were appropriate for the type of high-strength concrete they were using, typical high-strength concrete mixtures will include one or more supplementary cementitious materials and have a very low water-cementitious materials ratio (w/c). Curious About Easily Monitoring Your Concrete? Learn more here! Cylinders, as well as the structural elements produced with high-strength concrete, generally need additional moisture during the curing process for continued hydration of the cementitious materials. That being said, high-strength concrete mixtures have much different hydration characteristics than more conventional concrete mixtures and tend to self-desiccate, meaning they starve the cement paste from future hydration as they use all available water for the hydration process. This is where we might run into problems as standard-cured cylinders are supplied with the necessary moisture during the curing process, but field-cured specimens, as well as the structural elements, might not be, causing self-desiccation and discrepancies between standard- and field-cured cylinders. Another possible factor to explain the difference in strength for both tested specimens is moisture loss through the surface of the cylinders. If the field-cured cylinders are not provided with enough moisture during the curing process as mentioned above, they could develop initial moisture gradients as the exterior surfaces would dry faster and diminish in size as compared to the internal portion of the specimen. The shrinking caused during the curing process would lead to tension and micro-cracking at the surface which would, in turn, negatively impact the measured compressive strength and long-term durability of the structural element. Interested in Learning Why Curing Conditions for Test Cylinders is Important? Read Here! While traditional field curing methods may be more appropriate for conventional concrete with moderate w/c, they may not be suitable for high-strength concrete due to the fact that the hydration attributes of high-strength concrete are much different. High-strength concrete also has a higher demand for moisture during the curing stages which is, among other things, necessary for proper cement paste hydration. As per section 4.2 of ASTM, C31/C31M specimens must be standard cured in order to be used for acceptance testing for specified strength. Field-cured specimens are fabricated for comparison purposes with the standard-cured specimen test results and to let the user know when to remove formwork, etc. One possible way to eliminate discrepancies between testing methods and to ensure the most accurate field data would be to use the maturity method to determine in-place strength of concrete. Smart sensors can be used to measure and report more efficiently than break tests. Source: "Field- versus Standard-Cured Cylinders Made from High-Strength Concrete.” Concrete International, Aug. 2017, p. 64. I would like to see the ASTM C31 be more specific about the term initial curing and how it effects both standard and field cured specimens. I have dealt with QC QA people who think that from the moment a test cylinder is taken it is okay to just put in a box and let the temperature go over 110 degrees F. If you can keep a field cured cylinder protected for the first 48 hours before it is moved to point of placement, why would you not take advantage of this to insure the quality of your testing? It always surprises me that the language used in ASHTO & ASTM can be interpreted different ways depending on your point of view.